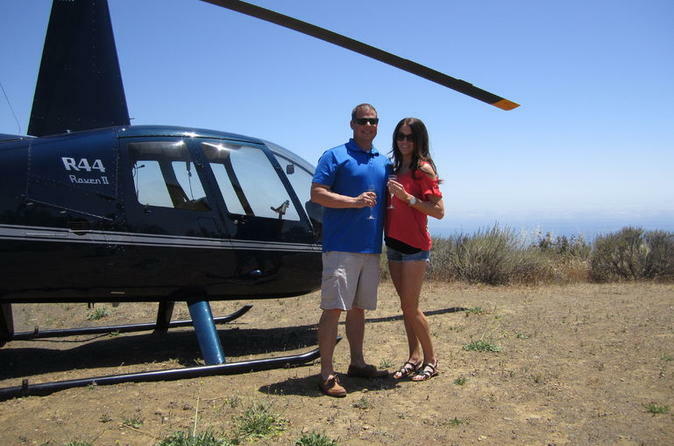 Experience the ultimate Los Angeles tour by private 4-seater helicopter, including a rooftop landing with Champagne toast in downtown LA. Soar the skies above Pacific Palisades, Santa Monica, Venice Beach and Marina del Rey before your expert pilot lands atop a building overlooking the city skyline. Your 50-minute helicopter flight takes off from Burbank’s Atlantic terminal, with multiple departure times available. Check in for your private helicopter tour at the Atlantic terminal in Burbank, an approximate 30-minute drive from downtown Los Angeles. Situated in the midst of LA’s entertainment district and close to Universal Studios, the spacious terminal greets passengers with comfy leather chairs where you can relax like a movie star before your 50-minute flight. Meet your expert pilot and climb aboard the 4-seater helicopter, then receive a safety briefing and settle in at a window seat before take-off over Los Angeles. Begin your aerial tour over the coastal regions of Pacific Palisades, Santa Monica, Venice Beach and Marina del Rey, each offering breathtaking views of pristine beaches and affluent homes. The pilot soars above exclusive celebrity homes in Bel Air, Beverly Hills and the Hollywood Hills — with an up-close look at the iconic Hollywood Sign and Sunset Strip. Then see Los Angeles in style as you make an exciting landing atop a downtown building, where you’ll have 15 minutes to snap photos of the city skyline. Toast your adventure with a glass of Champagne before you’re whisked away. Marvel at the eye-popping sights of Walt Disney Concert Hall, LA LIVE, Dodger Stadium, Griffith Observatory and more before you’re safely returned to the heliport. Please note: This tour requires a minimum of two people per booking.